In the previous post, I noted that damage from carbon emissions and other pollution from automobiles is estimated to increase in the future, no matter what fuel powers them. This is because the number of miles driven each year is expected to increase, overwhelming any difference between fuels. I thought a look at the data leading to this expectation might be in order. Vehicle miles traveled is important to environmentalists for just the reason alluded to above: cars are one of the principal sources of greenhouse gas emissions. They are also one of the principal sources of other kinds of air pollution. In Missouri, for instance, ozone is the most important air pollutant, and cars are a primary source of ozone. In addition, the highways built to accommodate vehicles are also damaging to the environment. The most current data on VMT consists of monthly estimates collected by the states and published by the Office of Highway Policy Information. The estimates are preliminary and have not been error-checked or adjusted for missing data, etc. 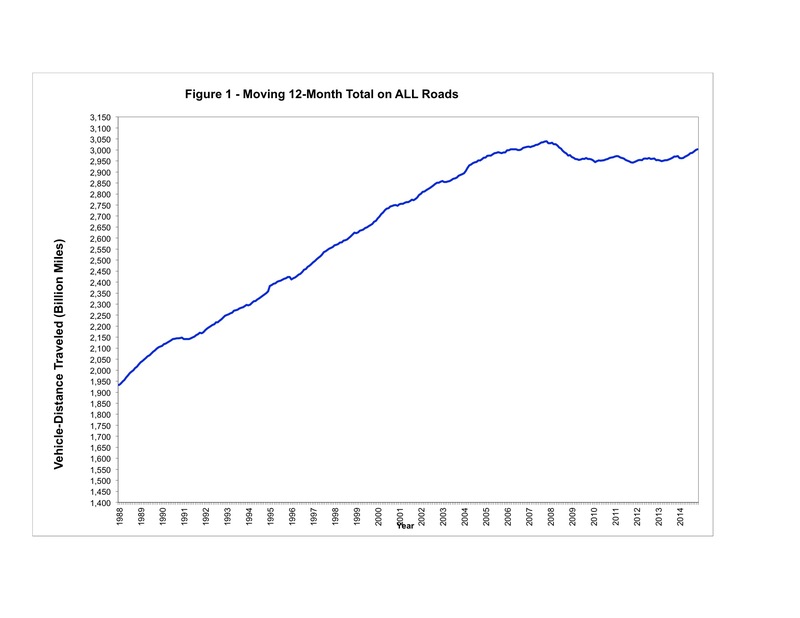 The first chart at left shows the rolling 12-month total of VMT on roads of all types in the United States. The data begin in 1988 and run through November 2014. Be sure to notice that the vertical axis of the chart does not start at zero, to better show the trend over time. From 1988 to 2007, the number of VMT increased at an amazingly consistent rate, peaking in November, 2007. Over that time, it grew from 1,933 to 3,039 billion miles. That’s a 57% increase, or an average 3% increase per year. During that entire period, their were small decreases in VMT in some months, but over every 12 month period there was an increase. In 2007 the Great Recession struck, and for the first time since 1988, VMT began a small, but sustained decline. The decline more or less hit bottom in early 2010, and then bounced along the bottom until mid-2013. Since then, it has resumed its increasing trend. The total decline was from 3,039 to 2,942 billion miles, a decline of 4%. From its bottom, it has increased from 2,942 to 3,003, still down almost 1% from November 2007. The timing of the decline and return to increase indicate pretty clearly that the decline was due to the economic recession, while the increase is now due to the recovery. The expectation is that, unless there is another economic upset, VMT will continue to increase. Americans drive more during the summer than at any other time. After all, the price of gasoline fluctuates yearly according to this pattern, going up every summer. The second chart at right shows VMT by month for the years 2011-13. There is a clear seasonal pattern, peaking from June through August. One reason VMT has increased over the years is because we drive more. Another is because population has increased and there are more of us. I’ll look at VMT in Missouri in the next post. 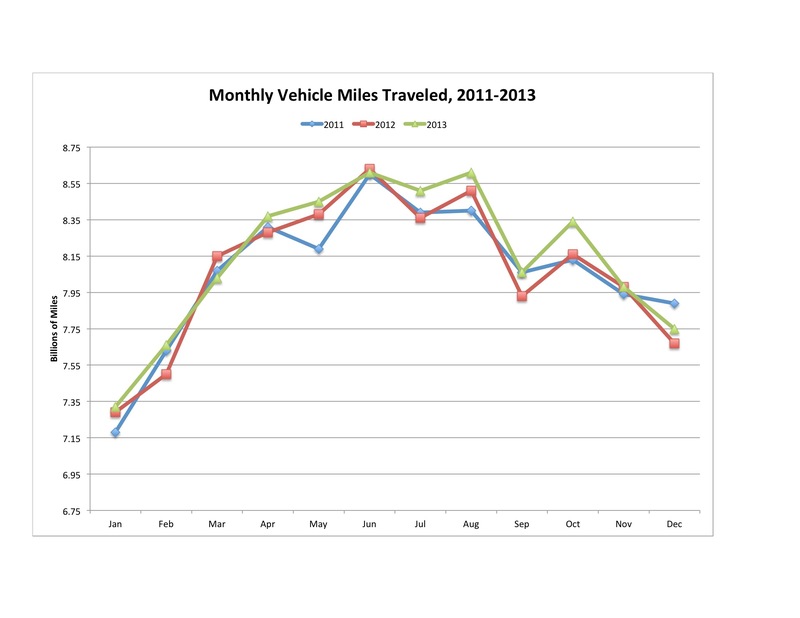 Preliminary data on monthly vehicle miles traveled: Traffic Volume Trends, December 2013. Office of Highway Policy Information, Federal Highway Administration. http://www.fhwa.dot.gov/policyinformation/travel_monitoring/tvt.cfm. Data after 12/2013 from: Traffic Volume Trends, November, 2013. Office of Highway Policy Information, Federal Highway Administration. http://www.fhwa.dot.gov/policyinformation/travel_monitoring/tvt.cfm. By mogreenstats in Energy on 2015/04/02 .